Since several years, the Trieste International Foundation has a specific program of analysis and research for the possible uses of alternative energy resources. 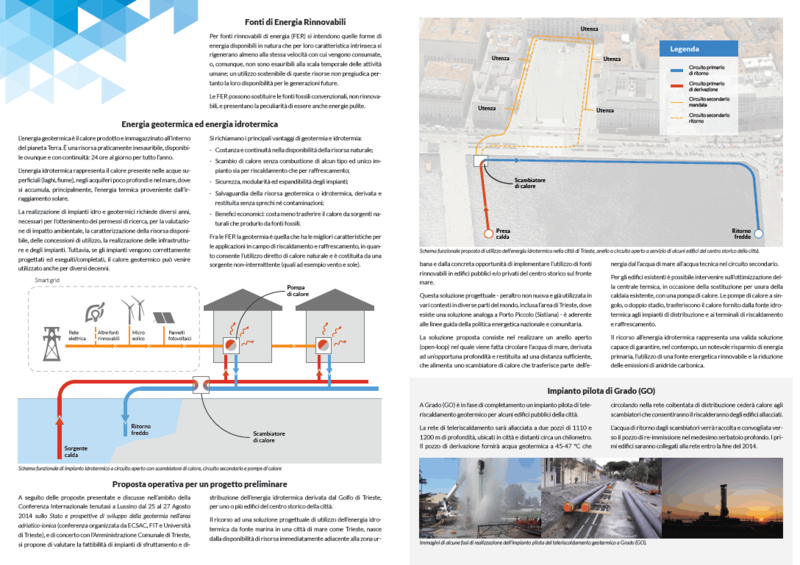 In this perspective FIT and the Department of Engineering and Architecture of the University of Trieste worked together for a feasibility study for the preliminary project “Trieste geothermal energy”. The intention was to make a survey of sciences and technologies in the field of geothermal energy exploitation and use, also as integration with seawater; the specific purpose was to identify possible solutions applicable in the Friuli Venezia Giulia Region (North East Italy) and, specifically, in some areas of the territory of Trieste. Intermediate phase: integrated analysis and synthesis of documentation and data concerning applications and current prospects of district heating, also considering the information and data acquired during the workshop “Workshop on Geothermal Energy: status and future in the Peri – Adriatic Region” Final phase: technical report that constitutes a proposal for a feasibility study for a preliminary draft to be implemented in specific areas of the territory of Trieste.